Asia is increasingly taking on a leading role in the fields of Good Clinical Practice (GCP) and ethics, two areas that are central to clinical research practices worldwide. 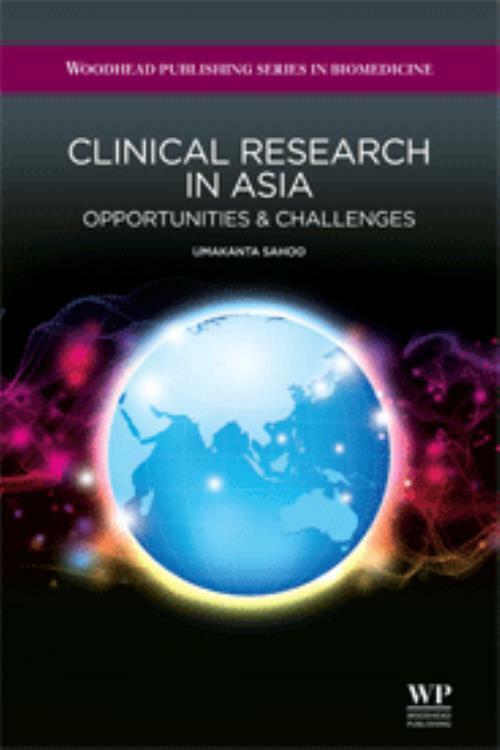 Clinical research in Asia examines the evolution of these key sectors in the Asian countries where the greatest developments are taking place, offering valuable perspectives on a wide range of issues affecting clinical research. Following an introduction that provides an overview of the topic and its strengths and weaknesses, each chapter of the book is devoted to clinical research in a specific country, focusing on issues including the history and evolution of clinical research, clinical trials and regulatory aspects. The chapters also offer a perspective on future trends in clinical research in each country. The book concludes with a discussion of the importance of political, economic, socio-cultural, technological, legal and environmental factors (PESTLE analysis). Sahoo, UDr Umakanta Sahoo is Executive Director for Asia Pacific and Managing Director for India at Chiltern, a Contract Research Organisation. He is a bioscience graduate with an MBA and PhD in Management, and has over 17 years of experience in the pharmaceutical industry and CRO sector.